Examining their loot after the big, frantic hunt in Orton Park, April 20, 2014. 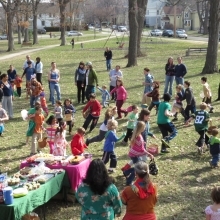 We could call this the first real day of spring when sunshine, temperatures, and firm soil all collaborated to provide great conditions for the 17th annual Marquette Neighborhood Easter Egg Hunt. 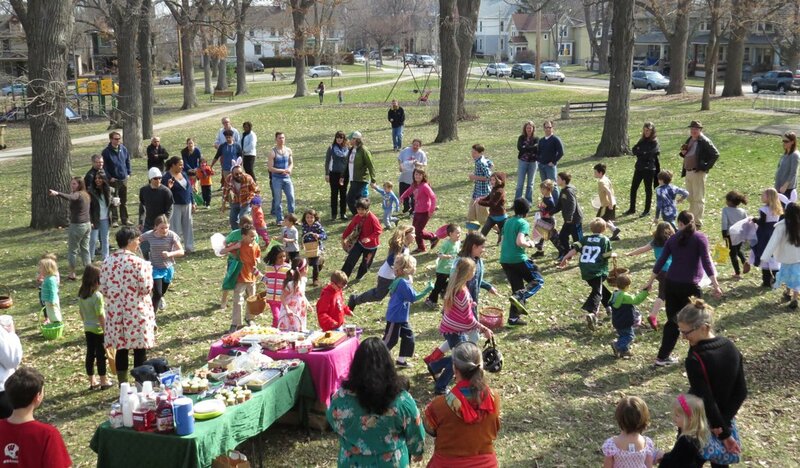 Over 40 children and their families gathered mid-morning Sunday (April 20) to share food and race across the park to find plastic eggs filled with all the things kids like in an egg, various forms of candy. Organized this year by Meghan Blake-Horst and Lynn Lee, the gathering harkened back to earlier neighborhood events that were smaller and more organic. This summer’s festivals are still a can’t-miss, but today’s event was just nice, uncomplicated, unamplified, chaotic fun. See the gallery below for images of the hunt. 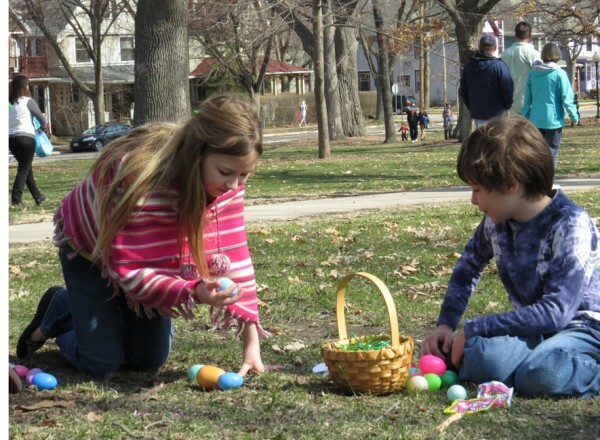 This entry was posted in Madison, Willy Street and tagged Easter Egg Hunt, Lynn Lee, Madison WI, Marquette neighborhood, Meghan Blake-Horst, Orton park by TheEastSider. Bookmark the permalink. The Spring egg hunt was started by Karen Lentfer and myself years ago when our children were small, as a celebration of Spring. The kids would design fliers and hand them out to families living near the park and they in turn would share the event with friends. Older kids help the younger children – some years in sunshine, others in rain or snow. It evolved to include a potluck brunch allowing neighbors to get re-acquainted after a long winter. In more recent years, as Karen and my children got older, Georgia Corner’s children helped with drawing and distributing fliers. Now more families with younger children are carrying on what has become an expected tradition.